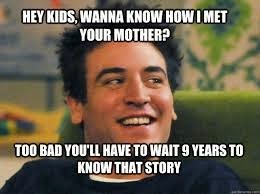 This is a lame confession, but I have finally started watching How I met your mother. When it was on tv I honestly moved a lot and I'm sure there were times I didn't actually have cable. So, that may have been a factor. But, also, the title just sounded dumb, and why would you tell your kids a story about all these other women you dated, in detail? It just seemed too dumb for words. I know I couldn't have sat still an hour listening to how my parents met. But, now that Netflix is what I have (and hulu that I never watch because commercials annoy me) and I've become one of those crazy people who constantly talks about a show that ended forever ago as if it is brand new. one of the best recurring plots is "the slap bet". have you come across the episode yet? I've seen a few episodes here and there, but I just never could get into this one. I feel like I missed out on a big piece of pop culture. I need to watch that show. It's still on my To Do list. HIMYM is awwweeeesome. I consider it the less nerdy version of Big Bang Theory. I haven't seen the final season yet, so I grateful for no spoilers! It's supposed to be on netflix at the end of this month and it's good that I'm soon to be on vacation so I can monopolize the TV during the day while my BF is at work.